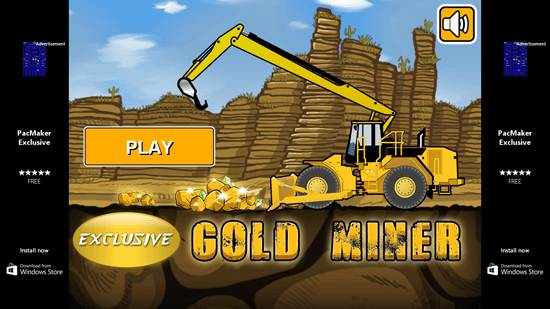 Gold Miner Exclusive is a free gold mine gaming app developed for Windows 8 and 8.1 desktop. The game is really interesting, it is fun and makes you be excited while you play it. The game play of this gold mine game is simple but not that simple, on the top of the ground level a truck is standing still with its hook and tow rope moving continuously from left to right. The challenge in this gold mine game is that you have to collect the different shaped gold mine and green and pink gems from under the ground with the moving hook. When you click with your mouse, the hook leaves the place and reaches out to the target where you stopped it. 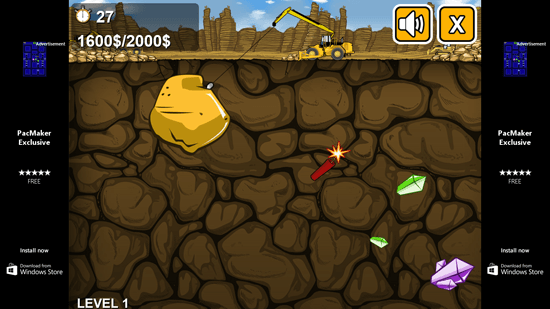 Another challenge in the game is to avoid the bombs that are placed at different places near the gems and gold mine. On the top left side of the game, a small clock keeps running and in that given time you have to collect the gems and the gold mine. Each gem and gold mine has some points, the points keep adding and it increases on the scale of it below the clock or the timer. Before every level starts, you will be given a target that has to be reached, if you can reach the target then you will be able to clear the level otherwise you will have to start the level again. The graphics of the game are really impressive as they are brightly displaying all the things that are to be taken into importance. The color of the gold mines are bright golden and yellow, the gems are bright green and pink, the truck on the top is in mud golden brown color and the color of the ground is light color of it.